The 2018 Futurity is over for another year and the revamped series has been highly acclaimed for bringing in a team of excellent National and International judges and vets. Hopefully some future stars have been spotted among the young horses and ponies that came forward across the 11 venues. We look a little deeper into the top scoring horses and ponies across each discipline. Across all age groups the highest score in the dressage section was awarded to Nicola Burton’s homebred Crocket, a chestnut son of the German stallion Quantensprung (Quando-Quando x Donnerhall) out of the Jazz daughter Eydon. 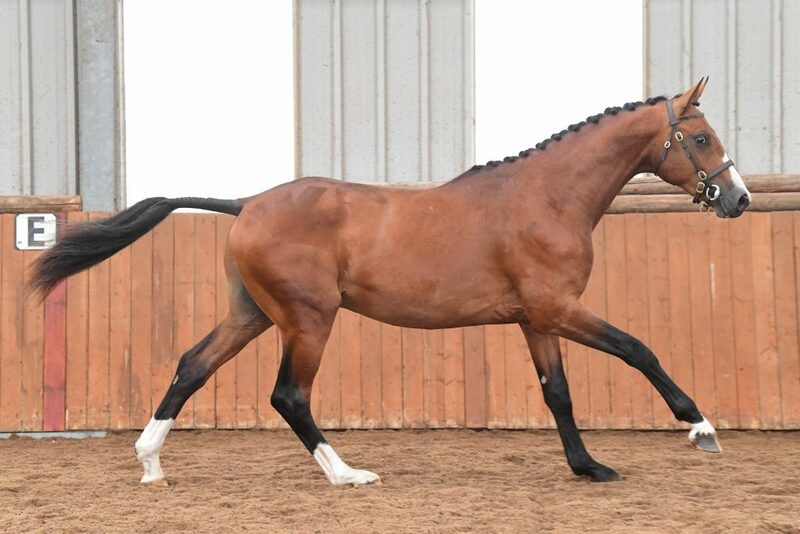 Eydon is also the dam of last year’s National Novice Silver Champion Hamlet (by Uthopia) and is a daughter of the stud’s foundation mare Promisses by Flemmingh. 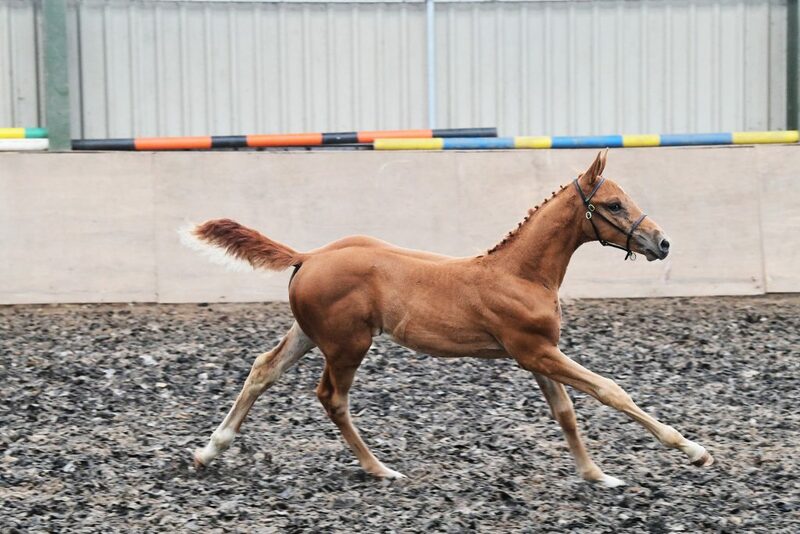 Crocket has been selected for the Elite Foal Auction at Stoneleigh in September. Also sired by a German based stallion was the 3yo champion Kristiansand, who is a daughter of the Grand Prix stallion Bordeaux (United x Gribaldi) out of the mare Black Sugar by Rubiloh. The dam competed to Small Tour and is also the dam of past Futurity graduate Margaux who was 3rd at the 2017 Futurity Championships. Kristiansand comes from the family of Belgian show jumping stallion Flyinge Electro who competed internationally for Sweden under Peter Erikkson. Owned and bred by Lizzie Sweet from Ladyswood Dressage, Lizzie also bred the highest scoring Futurity dressage yearling in 2015. The 2yo champion was Catherston Tick Tock by the British bred stallion Timolin and bred and owned by Jennie Loriston-Clarke. 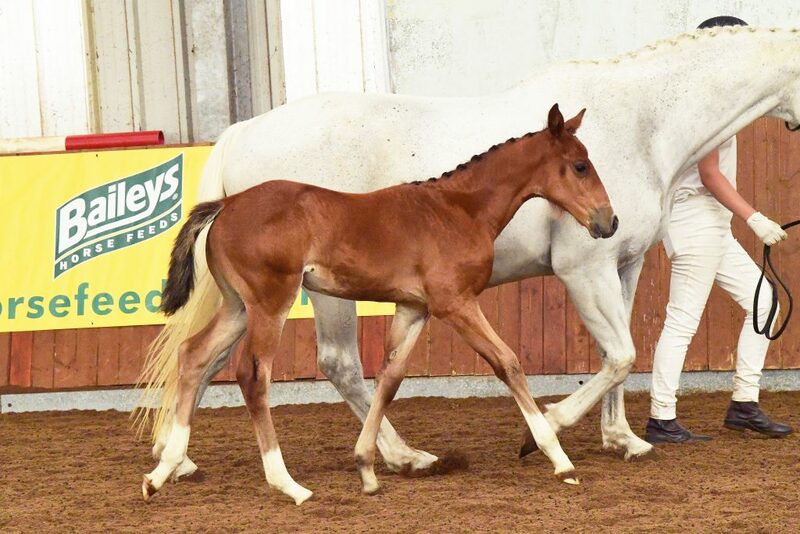 Tick Tock was also presented as a foal (Higher First) and a yearling (Elite) and in fact was the 2nd highest scoring dressage yearling last year. Tick Tock is a full sister to the 2015 Elite foal Catherston Timeless, out of the Breitling W mare Bee Precis. Tick Tock was also champion at the British Breeders Network show in 2016. Sire Timolin is also a product of the Futurity series, being awarded an Elite at the ages of one, two and three. He has successful combined a dual eventing and dressage career to date although being a son of Jane Gregory’s International Small Tour mare Samira by the Grand Prix superstar Totilas, the dressage arena would be his ultimate destination. 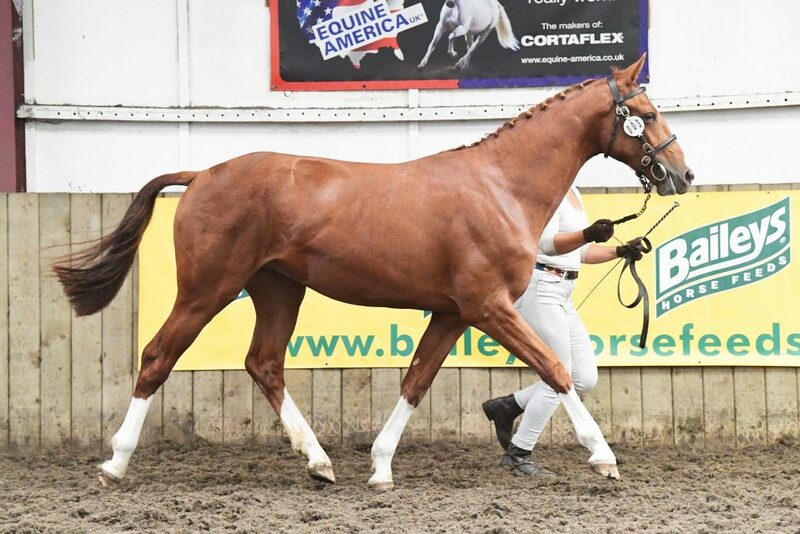 The Yearling Dressage Champion is also sired by a British bred stallion – Silver Lining ZB (by Supertramp). This was Summer Solstice, owned and bred by Tammy Ruffles. Tammy actually bred the filly Reminicse who was an Elite scoring yearling at the 2017 Futurity, just one place behind Catherston Tick Tock. Silver Lining ZB is now competing in Germany. In common with the other disciplines, a foal was again the High Score in this section, and in fact Aileen Stormonth’s Esme X was the Highest Scoring entrant throughout the whole series, being awarded a fabulous 9.525. This charming filly is a daughter of the 2014 Scottish Loose Jumping Champion Goodyear VDL out of a Belgian bred mare. Her pedigree contains famous names such as Indorado and Cento further back. It has to be said the standard of the 3 year old show jumpers down the jumping lane did not always inspire, but the leading 3yo of 2018, Kylie, did impress the evaluators and was awarded the only 3yo show jumping Elite. Kylie was bred by Castell Sport Horses and is owned by Jackie Plant of Select Sport Horses. Her sire Galliano, previously known as Amaretto LCH Z, was licensed by the KWPN in 2014 before ending up at Castell Sport Horses where he sired a crop of foals, including Kylie. He is a son of the international Grand Prix star Air Jordan Z. The dam Alliance (by Concorde) is half sister to International jumper Nero and many members of the dam’s family have gone on to produce dressage competitors. The 2yo champion Masterclass was also awarded an Elite score of 9 at the Tall Trees assessment. Owned and bred by Keith Lovelock, this colt has some classical bloodlines, being by For Pleasure out of a Balou De Rouet mare. The dam Westpoint Bijou, is now eventing. The motherline is one of Westpoint stud’s foundation lines, hailing from the Danish mare Rastello who produced a number of good offspring to their resident sire Fulton including CSI*** competitor Westpoint Ferdinand. The yearling champion also belongs to Aileen Stormonth, this being Argenteus, a son of John Whitaker’s international star Argento. The colt was actually bred by Jeanette Lewis of Oakenhall Sport Horses and is being produced as a future stallion. The dam Vamirette B is by the late great Baloubet Du Rouet x Damiro. Timolin sired a second champion of the 2019 series, this time the Elite eventing foal, Time to Fly. This June born filly was bred by Sally Warner out of a mare by the stallion The Crofter. He was an Irish Draught stallion who is also sire of the popular ISH stallion Cos Me is Black. Also earning an Elite in this tough section was the 2 year old gelding Cundlegreen Garanwyn. This smart youngster is half brother to the CIC*** eventer Hartpury Sky is the Limit, sharing the same Concorde dam Sammy Jo G. He is owned and bred by Vanessa Francis who also owns his sire, the Welsh Section D Felinfach Tory Boy, the sire of another Elite eventing prospect – Cundlegreen Birthday Girl and a county standard WHP in his own right. The high scoring yearling was another to be evaluated in Scotland – Mesmerize Me SSH by the coloured dressage stallion Zumanji Décor out of the Ed King Hill daughter Edwina. Bred by Rosalyn Serex the filly is now owned by Lottie Stewart. Edwina is also the dam of the AES licensed stallion Buenno and was a winner at county level in coloured classes. From the first leg of the Futurity to the last, to find the 3 year old champion at Northcote – Sunny Side Up. Owned and bred by Karen Fryer he is a son of the British bred Supertramp (Soliman de Hus x Rotspon) who is mentioned above as the grandsire of the Yearling Dressage Champion. The dam Cassandra van het Bruno’s Hof qualified for the Regionals at Prelim and Novice and is half sister to the dam of the licensed stallion Little Joe. Her sire Grandeur is by Grannus and thus adding valuable jumping blood to the pedigree. By a very small fraction the highest scoring Sport pony came from the Foal category. This was a very charming colt foal owned and bred by Penny Walster – Bathleyhills Orion by Penny’s homebred stallion Bathleyhills Monet. Monet is a Futurity graduate himself, being awarded an Elite Premium as a yearling and in 2016 was awarded the Competitions Stallions Award for the success of his offspring in the Futurity series. Orin’s dam is the homebred mare Bathleyhills Marionette by Sempers Spirit and ¾ sister to another Elite foal – Bathleyhills Marquis. Just 0.05 of a mark behind was the 3yo colt Barrowby Lord Darcy, a pure bred Connemara owned and bred by Tom McManus from Barrowby Stud. The colt really impressed the judges with his loose jumping and has a very exciting career ahead of him both as a sire and a sport horse. Lord Darcy had been awarded a Higher First as a 2 year old. He is by Drummore Sea Breeze, who is a son of Castle Gizmo, 2016 Connemara Sire of the year at HOYS. On the dam side is the performance sire Ormond Oliver who has offspring on European Pony teams. 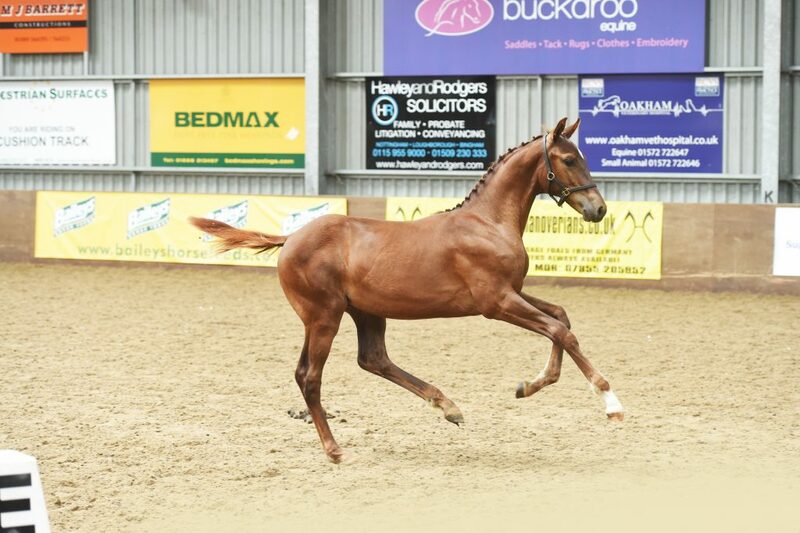 The highest awarded yearling was Pippa Drew’s homebred Hammerwood Flamingo, a son of the Welsh Section B stallion Lemonshill Falcon out of a mare by the late Hanoverian sire Rhondeo. The chestnut filly was in fact the highest scoring yearling across all disciplines and in 2017 was Champion Foal and overall Youngstock Champion with the SPSS. The 2 year old sport pony champion was WFD Diangello a filly by the Elite Graded SPSS sire Danger 36 out of one a mare by one of the UK’s most successful sport pony sires – Caesar 171. Diangello’s dam Bernwode Celeste was Reserve Champion of her grading and also carries the blood of another British pony sire stalwart – Bernwode Brokat. There were no Elite premiums awarded in the Endurance category this year, but the high score went to the April born colt foal Vlacq Lord Bazinga, home bred by Laura Pyke by her own stallion, the predominantly Crabbet sire Vlacq Zibaq out of Vlacq Sulime by the Thoroughbred Hipu Who. Laura has bred high scoring endurance candidates in the past including the High Scoring foal in 2014 – Vlacq Elladora. Also earning a Higher First was Ann Dark’s 3yo filly DD Gai Daneen, a purebred Arabian daughter of Deemonstrator out of Bey Dahmask. The Dark’s have a very successful endurance team headed by their daughter Carri Ann who competes internationally. The 2yo high score was another Arabian filly with Crabbet origins – Crystal Grey Charm by Crystal Romance out of Crystal Stardrift by Astar. The chestnut filly was bred Daphne Cocksedge and is owned by Ruth Whitby. And our final Champion of the series for 2018 was the yearling filly SB River of Faith, bred by Robyn Crisp of Silvabak Stud and owned Sarah Bamber. This filly is by the American Paint horse River Blue Champagne out of a Pintabian mare by Nikie NL. Next to look forward to is the Futurity Championship Show organised by the British Breeder’s Network where all Elite and Higher First Premium winners are invited to compete. This will be held this Sunday 9th September at Moreton Morrell. Anyone looking to purchase a smart British bred youngster should head over. Crystal Grey Charm is 100% Crabbet 100% Old English. So therefore that makes her pure Crabbet not from Crabbet origins. Her dam is a AHS premium mare too. Thank you Ruth. I am not an expert on endurance or Arabian breeding so thank you for correcting that.